I wouldn’t say that I have “a thing” for bottle openers. It’s not sexual. That would be weird. I merely appreciate good design, especially if that design facilitates the drinking of beer. And maybe I have a particular soft spot for bottle openers because I have never been that guy who can open a bottle of beer with any household item on hand. You know the people I’m talking about. The dudes who can open bottles with their wedding rings, their lighters, their teeth. I have a friend who can open a bottle with a folded napkin. No kidding. But not me; I need a specialized tool for the job, hence my obsession with bottle openers. I have them stashed throughout every space in my life. In my car, on my desk, hanging from my grill…there’s a bottle opener mounted on my garage door. I have one on my backpack. One on my flip flops and one on my belt buckle. I once bought a shirt because it had a built-in bottle opener pocket. So, when someone handed me this particular opener, the Blue Ridge Cap Lifter, I shrugged. The last thing I need is another bottle opener. But not all openers are made equal, and the BRCL rises above the fray. First of all, it’s a substantial tool. It’s not gonna fit in your pocket or on your keychain, but it feels good in your hand. Like a well-made hammer. The connection that I have with this opener is what I imagine Thor feels when he grabs his hammer just before battle—a mix of both familiarity and anticipation! But more important than the ergonomics (I’d hate to get carpal tunnel from opening so many bottles), is the fact that it doesn’t bend the cap when you pop it off the beer. If you’re a bottle cap collector, this is an important distinction. I don’t collect caps, but my nine-year-old son does. He has a box full of beer caps that I’ve popped in the name of journalism over the years. I don’t know why he collects them—my wife has a theory that he’s saving them to hand over to Social Services one day—but a pristine cap is important to him. So, it’s important to me. Hopefully Social Services will take note of my caring disposition. 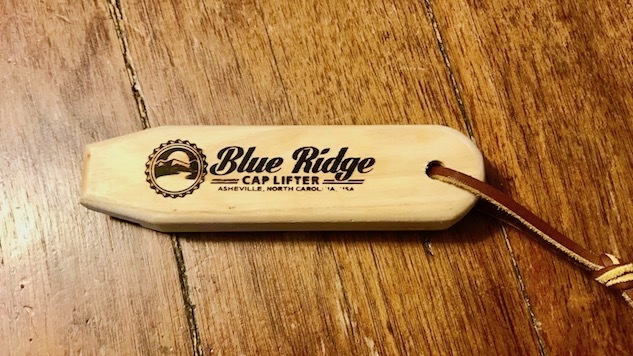 Another cool aspect of the Blue Ridge Cap Lifter is that it’s made from scrap wood. Blue Ridge Chair Works makes outdoor furniture from ash wood. These bottle openers are crafted from the scraps that end up on the workshop floor, saving an estimated 6 million pounds of wood from the landfill. Okay, I made that figure up. I’m not sure how much wood is diverted from the landfill, but every little bit counts, right? I’m not saying I’m some sort of eco hero who’s saving the world every time I open a bottle of beer, but I like to think I’m doing my part. One IPA at a time. And like I said, the pristine caps make my kid happy. So, this bottle opener is good for the environment and good for my kid. That’s a win/win.